Today my roots of running resurfaced as I set a new PB for my leg workout. The same death defying workout (not actually but my quads will say otherwise) from last week, except I heaved to completion in almost fifteen minutes less time. In theory, it seems like less time means less pain however that assumption would be incorrect, as I tested this morning. Cardio strength training is making a re-appearance to my program (unbelievably, no this was not it yet) so I have scheduled myself in with another trainer, R, tomorrow to workout. I am really focused on learning all that I can and so far this year, I can proudly say I have already soaked up so much more about fitness, training, and nutrition. Luckily, I have some co-workers who are dedicated, selfless promoters of all things fitness and I feel like I am standing on the shoulders of giants. Side note: If anyone has any suggestions how to thank a person for sharing daily life-altering wisdom, I would love to hear it. All I have got so far is the priceless stuff… as in, actually priceless, like high fives and shouts across the gym such as: “YOU DA MAN”! 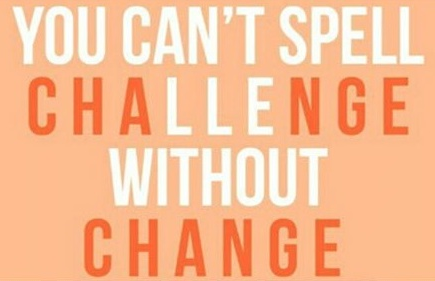 I am getting excited to start running again to see what a difference my strength makes. I already notice a substantial difference in my strength and in my body composition which feels rewarding enough. Well, I guess not enough, because I am still charging ahead. There are 14 weeks until I race again. If I needed a good omen then I found it: this race- to be exact- will be one year, one week, and one day after my surgery. Oh hey there. Things have gotten crazy on my end so thanks for sticking with me. This has been a time of re-evaluation and analyzing for me. I have had to temporarily refocus myself which meant about a week without exercise but thankfully I have some big goals on the horizon to scare me back to work. I blogged a few months ago about choosing a direction for ourselves and the importance of making a conscious decision where to place each step. Right now, I feel like one foot is mid- step and I am standing on a single foot sized island. There are many islands around me, and there are boats that can carry me. Most importantly, I can swim. I just don’t know where my compass is pointing me. We all feel defeated at some point, but with time and effort, we all make a comeback in some form or permutation. If we were never knocked down then how could we know how to stand? If we never felt defeat then how could we appreciate success? If we never left our island, how could we learn to swim? How can we discount negative experiences so quickly and neglect to see that we have gained experience after all? These self taught lessons always teach us best, like the first day of school in big colorful block letters. There is a saying that things always work out in the end, and if things haven’t worked out yet, it isn’t the end. 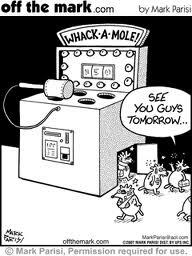 Eventually the feeling of being the rodent in “Whack A Mole” ends in an unpredictable dimming of lights and sounds, and your head pops up somewhere bright and new. No one really knows when the whacking stops or where the mole ends… but we all agree that those are both inevitable. Last week I hit some obstacles that I couldn’t see until they blinded me. Even a little stumble is movement and it will only add to my momentum whichever direction I propel myself. Here is to the comeback. Sounds like this girl needs to go for a trot.